At the World Conference on Drowning Prevention in 2017, Nathalie Vallières Martin was inspired with SwimTayka and came on board to help. 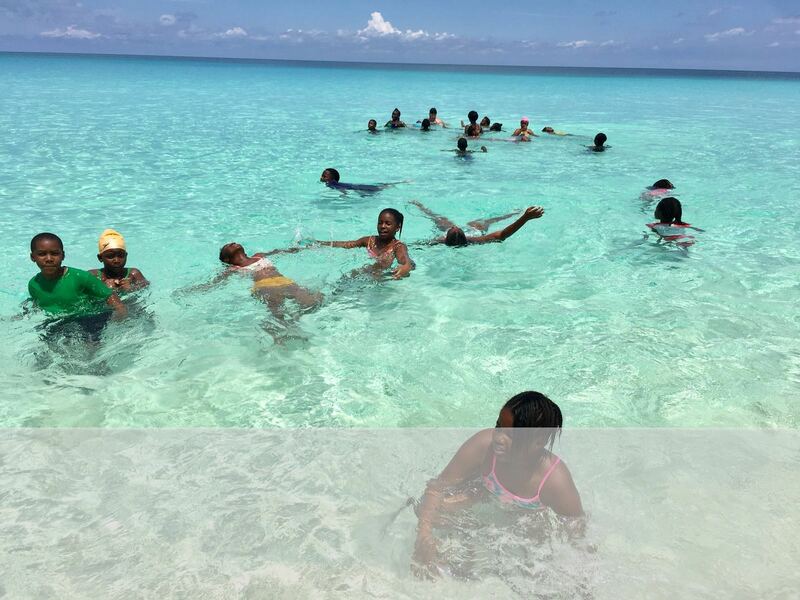 In 2018, Nathalie joined SwimTayka and went off to the Bimini Islands to run the Swimming programme for local children. The long-term initiative of this region will be to continue to involve local people and local partners so that they can develop a structure to build a self-sustainable swimming programme in the Bahamas. SwimTayka is planning its next training programme in Bimini Islands, the Bahamas in April and June 2019. Complete the details below to start your next adventure traveling the globe as a SwimTayka visionary. Volunteer selection is HIGHLY competitive, so it’s best to apply as soon as the project application opens. Get ready for a life-changing and beautiful adventure to the Bahamas! SwimTayka is conducting a 2nd project to the Bimini Islands, a small island in the Bahamas, we have two programmes each two weeks in duration, April 2019 and June 2019. Where we will work to collaborate with local waterkeepers, Save the Bays to pioneer the beginning of a national effort for teaching swimming and creating Environmental water Stewards in the Bahamas. The first step of this long-term initiative is the SwimTayka 5 day swimming programme, as well as donating needed equipment for the swimming efforts, including swimming costumes, goggles, and flotation devices. SwimTayka will be collaborating with Save the Bays to conduct the swimming and environmental water stewardship course. Save the Bays pride themselves in preserving and protecting the Bahamian environment through the promotion of policy change, education, legal action and advocacy, in an effort to ensure we have swimmable, fishable, drinkable water. The project’s course will be conducted during two weeks in April 2019 and June 2019 and will include a planned 60-80 children from the Bimini Islands. The long-term goal is to create a self-sustaining swimming programme on the islands and reach out to the other island around the Bahamas. Building a strong relationship for future exchanges and swimming projects through the entire archipelago. Your target fund-raising depending on where you are traveling from, we work out the costs of what is included in the project and provide you with a target to reach, please contact us below to find your minimum fund-raising target. *There is no language requirement for this project, although teachers who are bilingual in Standard English and Bahamian Creole and have training experience will be given priority in the application process. Complete the details below to start your next adventure travelling the globe as a SwimTayka visionary. Volunteer selection is HIGHLY competitive, so it’s best to apply as soon as the project application opens.